A Christmas song I created that has no words, only music. It is an original of mine. Christmas Morning Bells is about the joy and excitement of Christmas. I remember waking up on Christmas morning and seeing the presents under the Christmas Tree. It was a highlight of the year for me as a child. For days leading up to Christmas I could barely sleep. Track #14 of 15 songs on Christmas Piano. 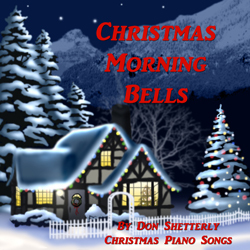 Don Shetterly created this song on November 2007 as he was thinking and contemplating about the joy of Christmas morning. Originally he named this song, Christmas Piano Morning. However as he was listening to the song over and over, it reminded him of bells. This is when he changed the name from Christmas Piano Morning to Christmas Morning Bells. Here is what Don Shetterly wrote after he created this song. Waking up to the joy, excitement and anticipation of Christmas morning. From the stillness of the night into the everyone up – there are presents under the tree. What did Santa bring? The joy in Children’s faces as they let the bells of Christmas ring forth from all over the earth. Let the piano music fill your hearts with happiness and joy. Even today when the holiday season is so crazy, there is nothing like the anticipation of waiting until Christmas morning to see what gifts are waiting under the tree. Yes, Christmas is more than gifts, but the joy and awe of that day give one’s heart and mind a sense of joy, peace, and goodwill towards men. There are no lyrics to this song. It is music only. If you come up with words that would fit, by all means, contact Don Shetterly and see where it may lead. The music that Don Shetterly creates has no words, because the notes and the songs speak for themselves. Some of the greatest Christmas music started out as poetry and was later joined by music that fit the words.